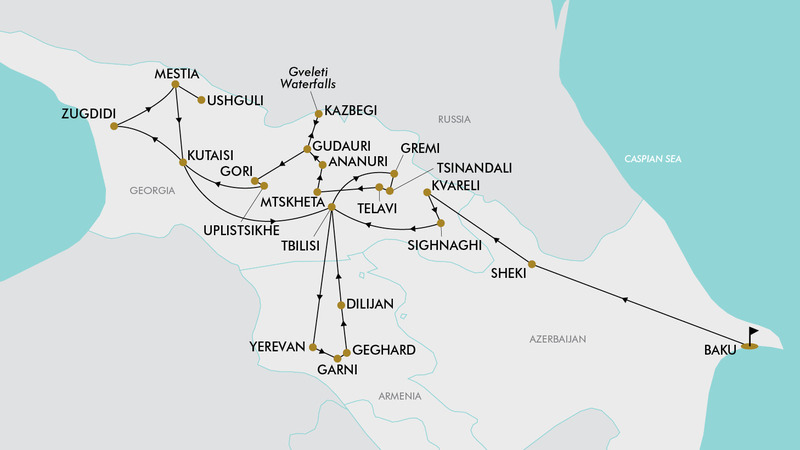 Discover the highlights of all three countries on this 25-day tour of Baku, Tbilisi, Yerevan, Kazbegi, Mesita and more. Be surprised by the contrast of old and new in beautiful Baku; visit Georgian wine cellars in a tunnel carved into the Caucasus Mountains; and explore the ancient rock-hewn monastery complex of David Gareja. Travel through the Gudauri Ski Region in the Great Caucasus Range; witness the alpine meadows and waterfalls of Khevi; and travel by 4x4 up Gergeti Mountain to the 14th century Gergeti Holy Trinity Church. Enjoy free time at leisure in Baku, Tbilisi and Yerevan, and so much more. Today depart from Auckland for Baku, Azerbaijan. Fly with award winning Qatar Airways (subject to availability). Please note due to flight scheduling this flight may involve a layover of up to 9 hours in Doha. Overnight accommodation will be provided by the airline. Upon arrival, be greeted at the airport and transferred to the hotel. This morning, after breakfast, you will head out on a city tour of Baku. First you will visit Memory Alley (Martyr’s Lane), which is a cemetery and memorial dedicated to those killed by the Soviet Army during Black January and also for those killed in the Nagorno-Karabakh War. Continue onwards to Upland Park where you may enjoy a panoramic view of Baku Bay. Afterwards enjoy a walking tour in the beautiful Old City area (a UNESCO heritage site). See historical and cultural sites such as the Maiden Tower, Shirvanshah’s Palace, Medieval Caravanserai, the hamams (bathhouses), Market Square, carpet shops, art studios and souvenir stalls. After lunch (not included) visit the world class cultural centre named after Heydar Aliyev, Azerbaijan’s third president. The Heydar Aliyev Centre consists of various exhibitions and is recognised as one of the world's most famous buildings, the masterpiece of Zaha Hadid has become an architectural landmark of modern Azerbaijan. Finish the day with a walk along the Seaside Boulevard, the longest promenade in Baku, before returning to the hotel for an evening at leisure. This morning after breakfast you will travel to some mud volcanoes (approx. 70 km from Baku). Mud volcanoes are a unique natural phenomenon with almost half of the mud volcanoes on our planet located in Azerbaijan. Afterwards continue to Gobustan Reserve, an open-air archaeological museum where you can observe the caves and petroglyphs of the Neolithic period (Stone Age). Gobustan has outstanding universal value, its rock art images depict hunting, fauna, flora and lifestyles in pre-historic times. In the afternoon travel onwards to the Absheron Peninsula where you may explore the Fire Worshippers Temple – Ateshgah. Until the late 19th century, it was the Zoroastrian pilgrimage place. Admire the flaming mountain nearby – Yanardag, where natural gas comes to the surface and has been burning since ancient times, attracting fire worshippers throughout many centuries. Return to Baku where you may enjoy the remainder of the day at leisure. This morning, after breakfast, check out and travel onwards to Sheki in the North-West of the country (approx. 330km from Baku). Snoozing amid green pillows of beautifully forested mountains, Şəki (Sheki) is Azerbaijan’s loveliest town, dappled with old houses with tiled-roofs and topped off with a glittering little Khan’s palace. Along the way you will visit Diri Baba Mausoleum in Maraza Village and the ancient Juma Mosque in Shamakhi, the medieval capital city. You will also cross a river canyon through the beautiful Muganly mountainous pass. This morning, check out and continue onwards to the neighbouring country of Georgia. Along the way visit the village of Kish and observe the ancient temple called “the mother of churches”. Once you have completed border formalities and crossed the border you will meet your Georgian guide who will drive you onwards to the town of Kvareli. Upon arrival visit a wine cellar located in a tunnel dug out of the flank of the Caucasus Mountains and taste some amazing Georgian wines. The temperature in the tunnel stays at an idilic 12-14 degrees throughout the year. It consists of two main tunnels, which are linked by 13 galleries. The total length of the tunnel is 7.7 km. After the wine cellar visit continue onwards to the hotel and check-in for an evening at leisure. For solo travellers a mandatory single supplement of $1160 applies. - All Premium Economy and Business Class upgrades are subject to availability (if we are not able to fulfil your business class request the upgrade cost will be refunded). - Baku, Azerbaijan (Pre Tour): $160 per room including breakfast. - Tbilisi, Georgia (Post Tour): $220 per room including breakfast. - Day 4: Baku: Mud Volcanoes & Gobustan Reserve Tour - $55 per person. New Zealand passport holders can visit Georgia without a visa for periods of up to 12 months. New Zealand passport holders can visit Armenia without a visa for up to 180 days per year. A tourist visa is required for Azerbaijan if travelling on a New Zealand passport. Electronic visas (e-visa) are for single entry, 30 day stays are available online through Azerbaijan's State Agency for Public Service and Social Innovations here: https://evisa.gov.az/en#. Allow at least three business days for online applications to be processed and ensure your passport is valid for at least three months from the expiry date of the e-visa.